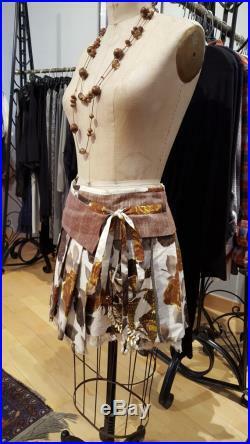 This wrap skirt was created by hand in our studio by pernilla deen. It is secured by an inside and outside tie. 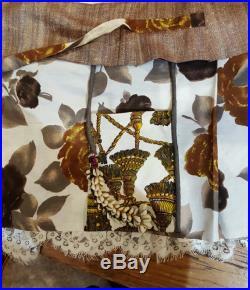 It is because of these ties the skirt skirt will fit a us size 4 to a us size 12. 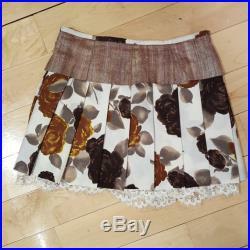 The skirt is 15.5 long (not including lace). 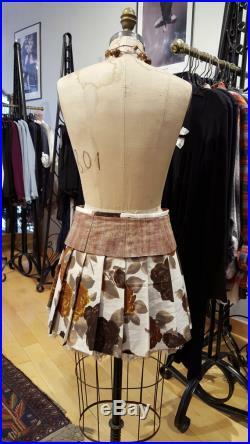 This collectible skirt is titled:" for chocolate for love"the base fabric is new cotton lycra. The pleated layers, lace ruffles, along with the yolk and ties are all vintage and upcycled textiles: cotton & silk. The ends of the outer ties are also decorated with cowrie shells. We love styling this romantic skirt over leggings, another longer skirt, harem pants, jeans or, in the hot weather, just a pair of bike shorts.